WHEN UTTAR PRADESH Chief Minister Yogi Adityanath wanted to change the address on his passport, he had to go to the regional passport office in Lucknow, and complete all formalities. His updated passport was sent by registered post to his official residence. For Ram Kumar Shukla, former MLA from the Lucknow West constituency, it took about a month to get a passport. Tanvi Seth, from Lucknow, who works in a multinational company in Noida, however, got her passport in an hour. It was not even sent by post as is the norm, but was handed over to her personally by passport officials. It has, however, snowballed into a major political controversy. 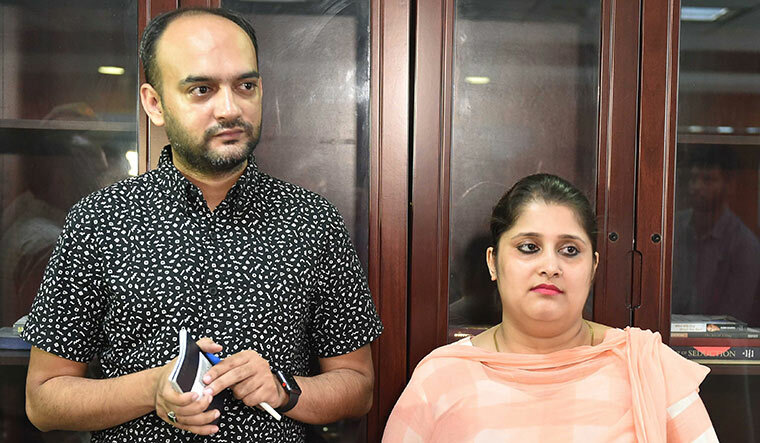 Tanvi and her husband, Mohammed Anas Siddiqui, applied for their passports on June 19 at the regional passport office in Lucknow. They were summoned to the office the following day. Senior superintendent Vikas Mishra, who reportedly spotted several discrepancies in the information Tanvi had furnished, asked her to rectify those. Tanvi said Mishra made derogatory remarks about her religion and her interfaith marriage. She had married Anas in 2007, after converting to Islam. External Affairs Minister Sushma Swaraj was targeted on Twitter by people who were opposed to Mishra’s transfer. She was accused of favouring Muslims. “Mishra raised objections about my name in my wife’s application, of me being a Muslim,” said Anas. “He asked Tanvi to change her name. When she refused, I was asked to change my religion and marry her according to Hindu rituals. He said only then would the passport be issued.” Mishra then sent the application to his superior, assistant passport officer Vijay Dwivedi. Tanvi said she was hurt by Mishra’s behaviour, while the rest of the staff were quite cooperative. “Choosing my name is my right. What Mishra did had a religious bias and was a kind of moral policing. It is not acceptable,” said Tanvi. Following her complaint, the ministry of external affairs issued Mishra a show-cause notice and transferred him to Gorakhpur. Tanvi got her passport immediately. Another objection was that while Tanvi worked in Noida, she applied for passport from Lucknow. She is originally from Patel Nagar colony in the eastern UP district of Gonda. After her marriage with Anas, she has been using his residential address. Anas stays in the Aminabad locality of Lucknow. Tanvi’s Aadhaar card shows this address. When THE WEEK visited the house, it was locked. Neighbours said the family left after the controversy broke out. Local intelligence unit officers who visited the house have found out that Tanvi had not been living there for long. Regional passport officer Piyush Verma said the incident has tarnished the image of the department. “We repeatedly counsel our staff to behave politely with applicants. The superintendent has been transferred and has been asked to give his reply,” he said. After preliminary inquiries, the Lucknow passport office sent its report to the ministry of external affairs, including the details of the documents furnished by Tanvi, and also Mishra’s reply. For an ordinary passport, police verification and local intelligence report are compulsory. Exemptions are made only in the case of government employees and for those who submit documents mandated by the MEA. And, regular passports are sent only by registered post. In Tanvi’s case, there are allegations that these norms were flouted. According to Kuldeep Singh, an eyewitness of what transpired between Mishra and Tanvi, the officer did not misbehave with the applicant, but only asked her to make necessary amendments to the application. In an interesting turn of events, Kuldeep was reportedly abducted from Lucknow on June 23 by some miscreants. According to the police, Kuldeep was taken to the jungles of the the neighbouring Lakhimpur Kheri district. He managed to escape when his kidnappers stopped for having tea. The issue, meanwhile, has led to a political slugfest. The state unit of the Shiv Sena has decided to honour Mishra. “Normally, it takes around a month to get a passport. In this case, it was done in an hour. The government is following a Muslim appeasement policy,” said Anil Singh, state president of the Shiv Sena. BJP MP Subramanian Swami, too, extended his support to Mishra, while External Affairs Minister Sushma Swaraj was targeted on Twitter by people who were opposed to Mishra’s transfer. She was accused of favouring Muslims and was called “visa mata”, referring to her interventions to grant visas, especially to Pakistani nationals, who sought medical treatment in India. Tanvi, meanwhile, has found support from the Congress. The party said in a statement that the demand to change religion for issuing a passport was objectionable and showed the divisive mentality of the BJP. The Congress also expressed solidarity with Sushma, and blamed the BJP for the mess. The foreign minister found support also from the Aam Aadmi Party and the Samajwadi Party, while the BJP has not commented on the issue so far.